Belfield last hosted an international match in 2015. THE FUNDING STAND-OFF which has left the National Hockey Stadium unfit for purpose is nearing a resolution, with University College Dublin (UCD) now in a position to make a significant investment towards its much-needed upgrade. The Belfield venue’s certificate to host international matches expired as far back as 2013 but plans are now in place to resurface the water-based pitch to meet International Hockey Federation (FIH) standards again. UCD Sport has engaged with Sports Labs Consult, an international sports surface consultation firm, and the hope is that the project, which will cost in the region of €300,000, will be completed in time for the start of the 2018/19 season in September. The42 understands that UCD is in the process of securing the necessary funding for the redevelopment to proceed as early as June, with the college now willing to foot the entire bill without the financial assistance of Hockey Ireland or a Government grant. That represents something of a u-turn by UCD who, as of this time last year, were insistent in their stance that the pitch wasn’t in need of an upgrade despite the FIH’s intervention and a clear deterioration in the surface’s condition in recent years. UCD director of sport, Brian Mullins, has lobbied for funding to be made available for the redevelopment of the National Hockey Stadium’s playing surface and this news follows the recent announcement that a new €3 million track-and-field facility will be installed on campus in the near future. It is also believed UCD plan to resurface the college’s second hockey pitch, a sand-based facility located close to the Belfield Bowl, while the National Hockey Stadium will have a new state-of-the-art video system installed. As with the athletics track, it is a case of better late than never after previous discussions between Hockey Ireland and UCD resulted in an impasse over who was going to pay for its redevelopment. The current surface — visibly deteriorating in certain areas, particularly at either end, while other infrastructure such as dugouts are in dire need of refurbishment — was installed over a decade ago. Under the proposals, UCD will begin the public procurement to find a pitch supplier at the end of May and the hope is that work will be completed between an eight to 10 week window, with a view to it being ready and available for use by September. The previous arrangement saw Hockey Ireland and UCD men’s and ladies’ clubs share co-tenant rights, with all parties allocated a certain number of hours per use, but discussions are ongoing over who will have pitch priority going forward and whether the governing body will now have to pay a rental fee given they have not contributed financially towards the redevelopment project. “We’re continuing discussions with UCD regarding the hockey pitch in Belfield and are aiming to find a solution that works for both parties,” Hockey Ireland CEO, Jerome Pels, says. The last international game to be played in Belfield was Ireland’s challenge match against Argentina in October 2015, and in the interim Hockey Ireland has used various venues around the country — including Stormont, Monkstown and Cork — for national team fixtures. 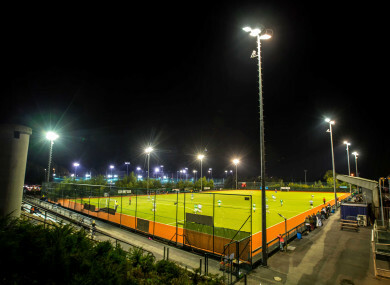 UCD’s decision to invest in its hockey facilities is a welcome boost for the college’s clubs but also a major fillip for both national teams, who are currently preparing for their respective World Cup campaigns. While Hockey Ireland own a plot of land at the National Sports Campus and remain hopeful of having a training base out in Abbotstown at some point in the future, it is envisaged Belfield will become the primary hockey venue in the country again. Email “UCD continue heavy investment in sport as National Hockey Stadium set for much-needed upgrade ”. Feedback on “UCD continue heavy investment in sport as National Hockey Stadium set for much-needed upgrade ”.